Lane Johnson parlayed the Eagles' underdog playoff status into a fundraiser for Philadelphia's schools this week. 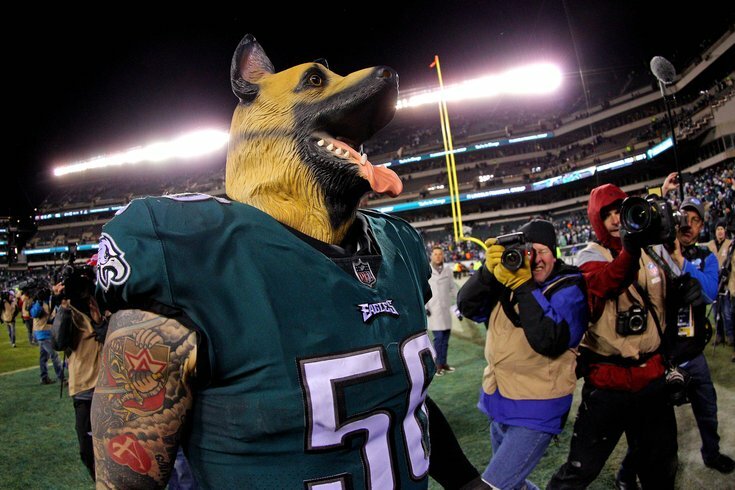 After mocking the Eagles' underdog status against Atlanta Falcons by wearing a German Shepard mask after the Eagles' 15-10 win at Lincoln Financial Field on Saturday, the Eagles right tackle announced on Tuesday that he will sell Eagles underdog T-shirts on his website to benefit the School District of Philadelphia. Printed on the shirt are Johnson and defensive end Chris Long wearing the masks with text reading, "Home Dogs Gonna Eat." The shirts cost $18 and can be bought through Johnson's website, LJ65.shop, or at Chickie's and Pete's restaurant on Thursday from 7 to 10 p.m. Proceeds will benefit the nonprofit Fund For The School District of Philadelphia. Johnson and Long wore the masks on the field after winning Saturday's game, a rather blatant mockery of Vegas oddsmakers making the Eagles 2.5-point underdogs despite being the No. 1 seed and playing at the Linc. The masks had been ordered on Amazon, and injured left tackle Jason Peters apparently kept them safe inside his coat during the game. The Birds opened as 3.5-point home underdogs against the Minnesota Vikings for the NFC Championship game on Sunday. The Eagles said this week that they will allow fans to wear their own "underdog" masks at the game.